If there’s one thing everyone in America can appreciate, it’s sleep. 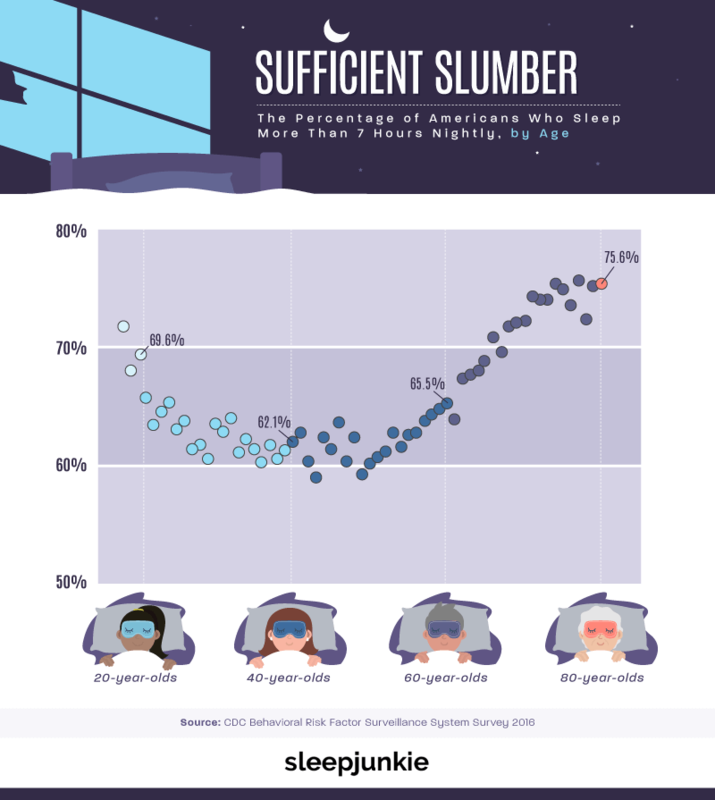 The allure of a good night’s rest transcends demographic differences. Urbanites and rural residents alike enjoy collapsing upon their beds after a long day, and teenagers and senior citizens can equally extol the virtues of a much-needed nap. 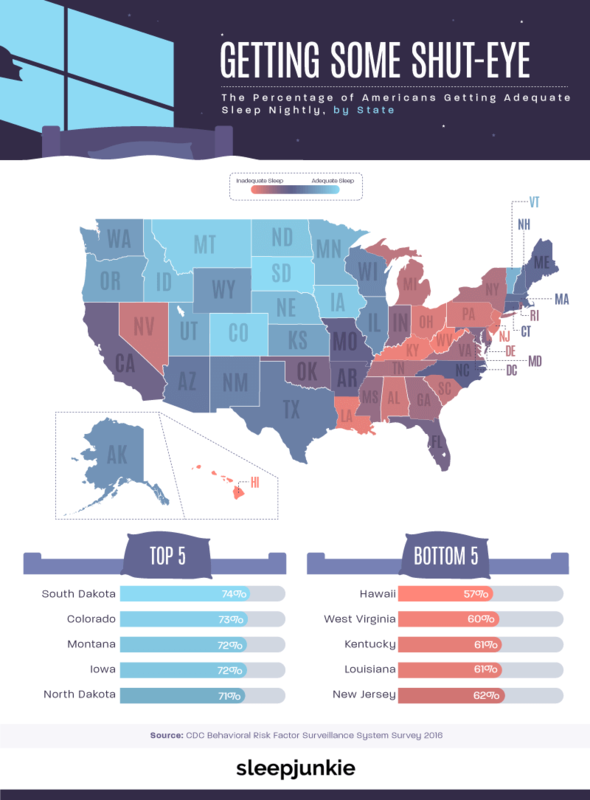 Whatever our other differences, Americans from coast to coast sure love their shut-eye. But even if we’d all like more sleep, who’s getting enough of it? Where are Americans the most well-rested, and where are they sleeping less than health experts recommend? 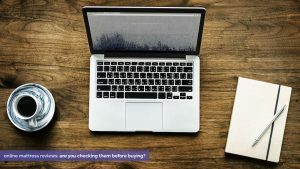 To find out, we explored data from the Behavioral Risk Factor Surveillance System, the world’s largest continuously conducted health survey featuring sleep data from all 50 states. 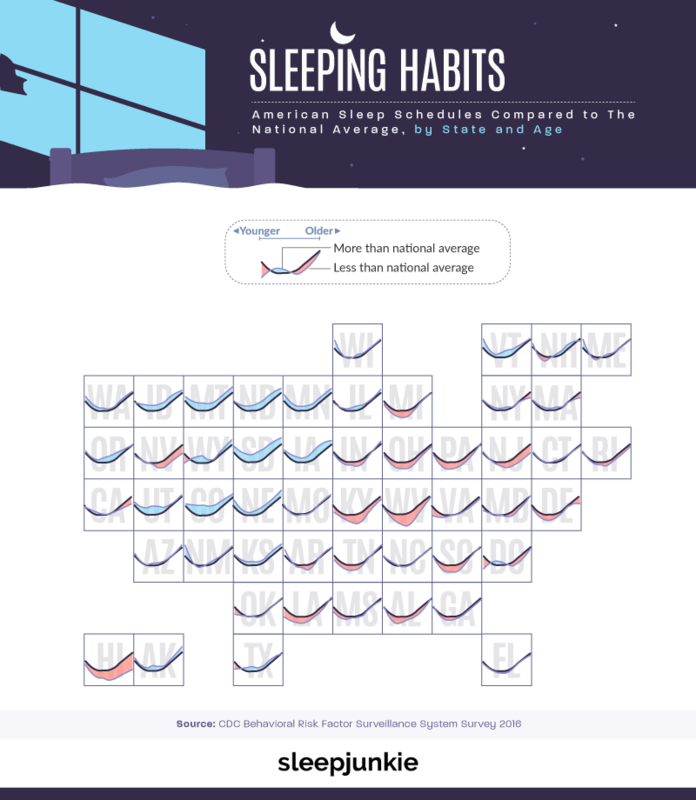 Our findings reveal which Americans tend to sleep best – and how their health and happiness may hang in the balance. Our data demonstrate that the majority of Americans at every age get at least seven hours of sleep each night – the minimum suggested by the CDC. Significant variations can be observed among age groups, however, with a consistently declining trend line as respondents progress through their 20s. This drop plateaus as Americans approach middle age, until the percentage of those getting enough sleep starts to rise precipitously around age 50. By 80 years old, more than three-quarters of Americans meet the seven-hour standard. This progression is particularly interesting because it corresponds roughly to patterns of self-reported happiness as we grow older. Described by scientists as the “U-bend,” the phenomenon of declining happiness until middle age and the subsequent rise in our later years is well-documented. While various causes might account for these tandem trajectories of sleep and happiness (such as child care and professional obligations), perhaps sleep itself plays a part in how happy we feel at any given time in our lives. Turning to sleep data from each state, we find few outliers to the “U-shaped” trend visible in the national data. 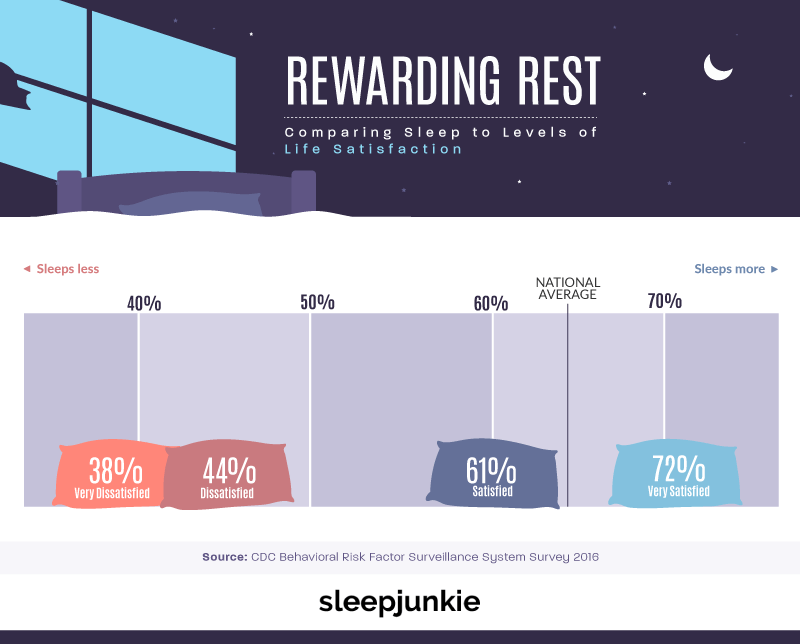 But as far as comparisons among the states, significant differences emerged in terms of the percentage of residents getting their needed hours of rest. States in the North and Midwest were particularly inclined to sleep, with Idaho, Colorado, Montana, the Dakotas, Iowa, and Minnesota each demonstrating higher than average rates of healthy rest for all ages. Notably, many of these states are renowned for the intensity of their winters, a season full of physiological cues for us to take cover under our blankets. The Northeast – no stranger to harsh winters of its own – proved likely to get less sleep, however.New Jersey and New York ranked among more rest-averse states, lending some credibility to the Big Apple’s reputation for never sleeping. Hawaii was also a strikingly sleepless location, a fact some local experts attribute to economic stressors. But no region lacked sleep so consistently as the South. Kentucky, South Carolina, Alabama, and Louisiana each had fewer healthy sleepers than the national average at virtually every age. Setting aside differences in age, we also studied the total percentage of those in each state getting enough rest every night. This broader look confirms some of our earlier conclusions: In some top states, like South Dakota and Colorado, nearly three-quarters of residents are getting their recommended seven hours. Here, too, it’s tempting to draw a correlation with happiness. Many of our best-rested states have also been frequently ranked among the happiest, using a range of life satisfaction measures. At the more tired end of the spectrum, Hawaii and West Virginia saw the lowest rates among all states. Sleep and health can have mutually beneficial effects, so perhaps it’s no surprise that West Virginia has struggled in both categories simultaneously. It numbered among the bottom 10 in the United Health Foundation’s annual state health rankings in 2016, as did fellow sleep-starved states Kentucky and Louisiana. As discussed earlier, our data suggest a relationship between sleep and emotional well-being. A far greater percentage of respondents reporting life satisfaction got seven hours of sleep on average, as compared to those who did not report the same level of satisfaction. Moreover, very satisfied people were nearly twice as likely to sleep enough as their very unsatisfied peers. While we all have anecdotal evidence to this effect (going sleepless tends to leave us cranky), much recent research suggests the link between sleep and happiness is even stronger than we might suppose. In one recent study, sleep quality was the top predictor of self-reported emotional well-being, beating out financial wealth. 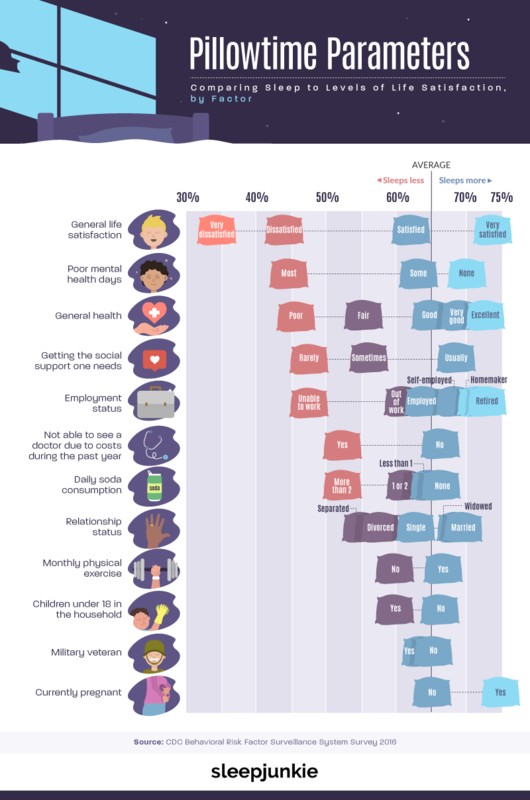 Which other important life factors might be tied to how much we sleep? We plumbed our data to find out. By juxtaposing rates of sufficient sleep with other aspects of our data, we found several compelling suggestions of cause and effect. Mental and physical health each corresponded closely to sleep, perhaps indicating a vicious cycle in which pain prevents sleep and fatigue prevents healing. Similar dynamics might account for the sleeping troubles of those who don’t exercise: It’s difficult to hit the gym when tired, but exercise can profoundly improve sleep quality. Other healthy choices seemed to correlate with improved rates of sufficient sleep as well. Those who don’t drink soda were particularly likely to get the sleep they needed. Still, some correlations were more surprising, such as the sleep troubles of those not currently working. Perhaps the financial and personal stress of unemployment explains this trend, while also accounting for some of our state-level observations. Many of the states with low rates of healthy sleep also suffer from high unemployment rates. Our results make a forceful case for the value of sleep across the United States, perhaps in more areas of our lives than we might have expected. Indeed, our findings should give us pause when choosing between sleep and some other priority. It’s easy to understand why so many forgo the sleep they need: In the face of obligations both personal and professional, we compromise our rest to keep up with our other responsibilities. But sacrificing sleep may have deeper implications than our temporary discomfort, as our data suggest. When it comes to what truly matters – our happiness and health – it’s hard to conceive of anything that plays a more critical role. If you’re ready to enjoy the benefits of sleeping better, we’re here to help. 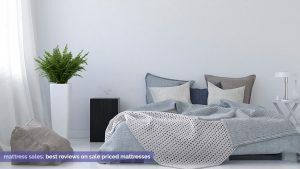 SleepJunkie.org is your source for sleep solutions, from the latest mattress reviews to coverage of the latest scientific breakthroughs. We’ll guide you toward getting the rest you require, so you’ll never go without your seven hours. This project draws its data from the 2016 Behavioral Risk Factor Surveillance System report produced by the Centers for Disease Control and Prevention. We indexed the survey data on sleep by age, state, and a range of other indicators of well-being to produce the findings presented above. Want to share the importance of sleep with your readers? Feel free to use our findings and graphics for noncommercial purposes. Please attribute with a link to this page when you do so – you’ll sleep better for being honest.